This authentic mesquite flavored fajita marinade recipe is just what you're looking for when making either grilled chicken or steak fajita. It works very quickly on chicken but for optimum results on steak I find an overnight soak works the best. The lime juice and tequila in this recipe combine with the strong flavors of cilantro to make this a powerful enough for steak. 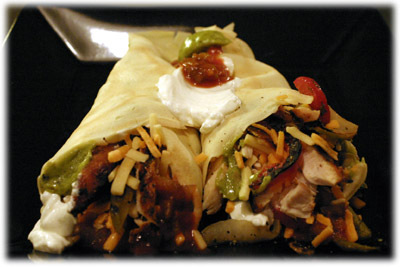 This marinade really does bring an authentic Tex Mex restaurant taste to your favorite fajita recipe. Adding liquid mesquite smoke flavoring is optional but I recommend it so you get a more authentic restaurant fajita flavor. And this recipe is so easy, no cooking involved, simply mix the ingredients together and let them go to work on your chicken or steak. Note: for best results marinate the meat 4 hours to overnight. Tip: I recommend using the liquid mesquite smoke flavoring unless you're planning on using real mesquite smoking chips while you grill the steak or chicken. 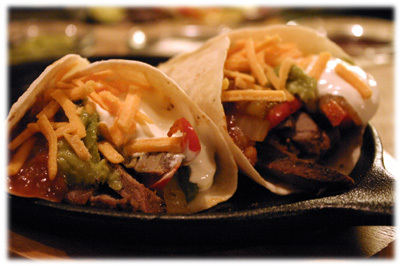 In a medium sized glass mixing bowl combine all of the fajita marinade ingredients. 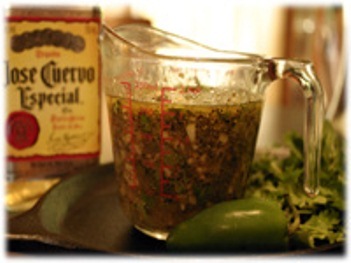 Mix very well to ensure the oil combines with the lime and tequila. Place your steak or chicken in a plastic resealable bag and pour in the marinade. Work the meat around inside the bag to ensure the marinade covers it completely. Place in a refrigerator for 4 hours up to overnight and flip over now and then to make sure all sides of the meat are covered. I recommend a longer soak for beef than chicken.